Spoilt for choice in Richmond, I cannot help the small pang of jealousy that Pascoe Vale has Ferrovia Deli & Fine Foods. Here is a cute neighbourhood café that is comparatively small both inside and out, with a feel of the suburbs. There is no line, but there is a sizeable enough crowd to deliver a nice atmosphere. The service is relaxed and friendly, but still well tuned. All aspects feel comfortable and homely. I came across Ferrovia about six months ago when looking for a coffee in what is a random area for me having led an existence around the inner city for all the years I’ve lived in Melbourne. Back in Perth I grew up in the suburbs, but there were no quality cafes within cooee. At that first time the coffee was great, and I instantly vowed to return for breakfast. The interior is rustic, with dark tones; the focus being on the display window, tables and chairs scattered around where they can fit. Looking at the menu there are plenty of good looking options. A traditional dish, but one I’m not familiar with, the Eggs in Purgatory jumps out to Catherine. I decide to try an old classic that I haven’t eaten in a long time. Catherine’s eggs in waiting for heaven is basically poached eggs in a Napoli sauce topped with with pesto and pecorino cheese. This dish is made by the rich Napoli sauce which is oozing flavour, freshened by the pesto. Obviously all of the ingredients are on the heavier side, but Catherine loves the combination. 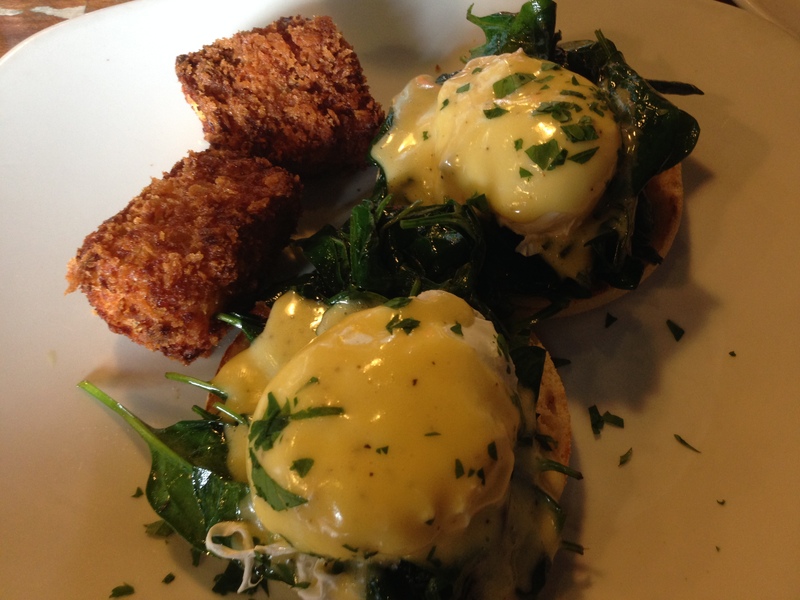 My eggs Florentine also has perfectly poached eggs, the yolk running over just-steamed spinach. The hollandaise is terrific, and this classic combination is executed much better than average. The whole dish makes me regret not having ordered it for years. Our sides of bacon and crunchy hash browns, in particular, are excellent too. Ferrovia’s coffee is fantastic. Using only a blend, the three I try are consistent, my long black each time is well made. Catherine’s orange juice is freshly squeezed; nice and sweet. 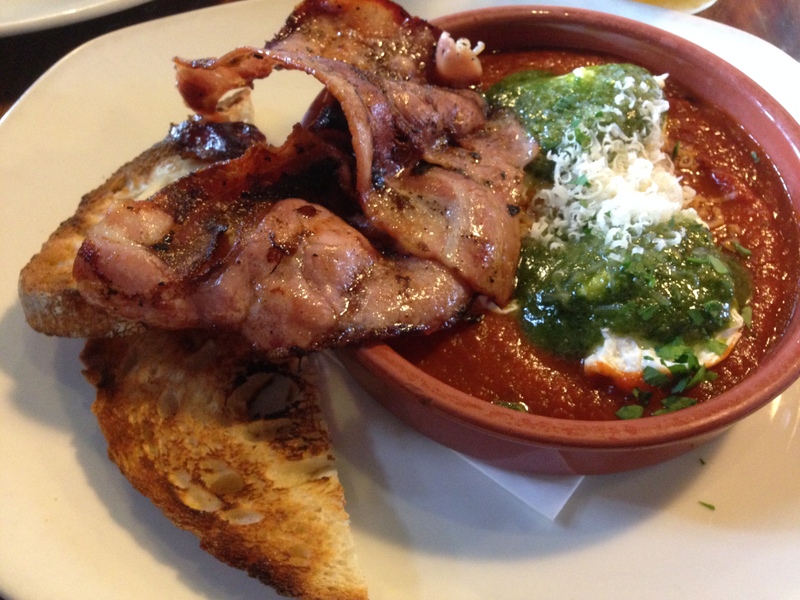 Out in the suburbs, Ferrovia is serving up food and coffee that stands up to the better cafes in inner city Melbourne. It goes to show that driving that extra bit doesn’t necessarily reduce the quality, but you certainly won’t have to wait in line as the weekend goes by. Expectations are one of the most important ingredients in any restaurant experience. Try as we might to lower them to a reasonable level, the more hype, and the longer the wait between booking and dining, the more difficult it is to not over inflate. 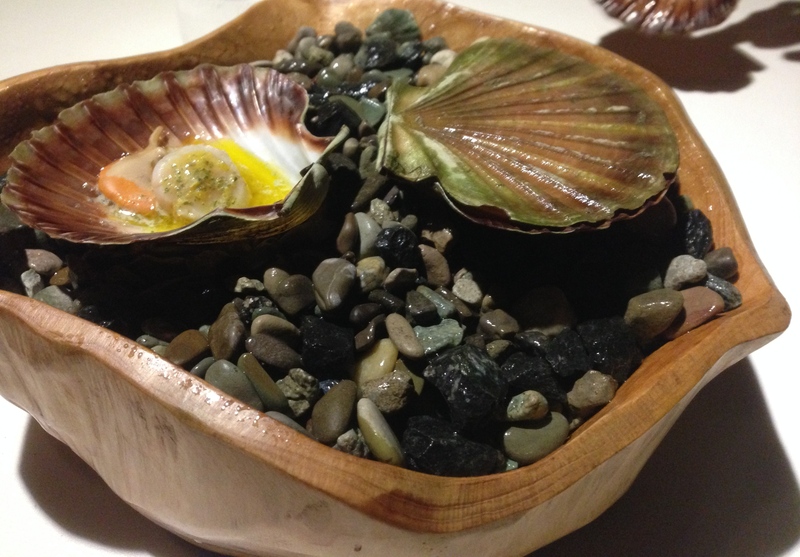 For me, tonight’s dinner at Attica is the most prone to setting expectations to unreasonable levels, so I jotted them down in the hope of being objective. There are many obvious, and a few less obvious reasons, why I expect to have one of the best restaurant experiences of my life here. 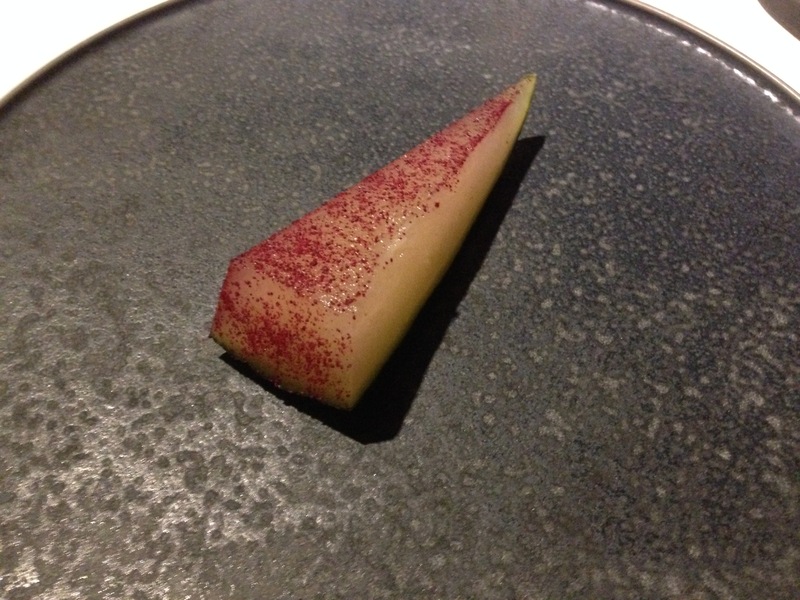 Of course, Attica is Melbourne’s highest ranked restaurant on any number of guides, over a number of years. The less obvious reason is that I already rank Ben Shewry’s temple as one of the top experiences I’ve had in Australia, and around the world. But that was five years ago. Now that it is mentioned in the same breath as some of the world’s greatest restaurants, you hope for the small (but important) improvements you’ve read a little about to take it to the next level. As we walk out the back to the restaurant garden, to be greeted by one of the pastry chefs, and are offered tea and a home made mint slice biscuit (that is delicious), we get a chance to reflect on one of our great meals in the cold winter air. So far, in the lead up to dessert, we have tried twelve snacks, and four courses of savoury dishes. There are highlights; but there are no lowlights. It is hard to imagine being happier with a meal. Attica is putting an emphasis on native Australian ingredients, in a completely approachable manner, with hardly an ounce of pomp. Personally I like challenging food that makes you think and take notice, and there are different ways to achieve wonder and awe. 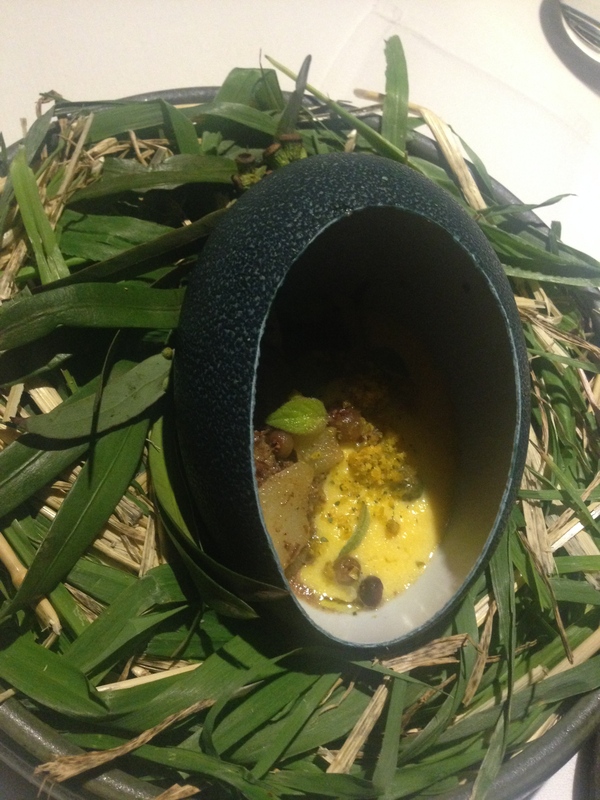 At Orana, which also has an Australiana focus, you are presented with ingredients like green ants that do taste great, but are challenging to approach. I think Attica is making you take notice in a different way, with more subtlety, and some familiarity in the flavour combinations. An example that has stuck in my mind for this past week is the saltbush fed lamb pie. Classical Australian presentation (resting on a brown paper bag), the pie has some manchego grated over it, and there is vegemite in the filling with the saltbush lamb. It is brilliant, absolutely brilliant, and I can’t stop thinking about it. There is some challenge in a few ingredients though. To preface, I haven’t mentioned service yet, but our waitpersons use the perfect balance of professionalism and friendliness, along with genuine care. Towards the beginning we have a conversation about the meal ahead. It is the type of discussion that puts you at ease because you realise that your waitpersons are there to guide and improve your experience, and there doesn’t seem to be this overarching will of the chefs being pushed upon you, like some other fine dining establishments. Our waitperson explains that one thing they need to confirm we are comfortable eating is the kangaroo tartare. Here we are talking about raw meat, and a particular meat that isn’t eaten often by most people. We are happy to try it as we trust the ability of the chefs and the quality of the ingredients. Catherine did hesitate though. 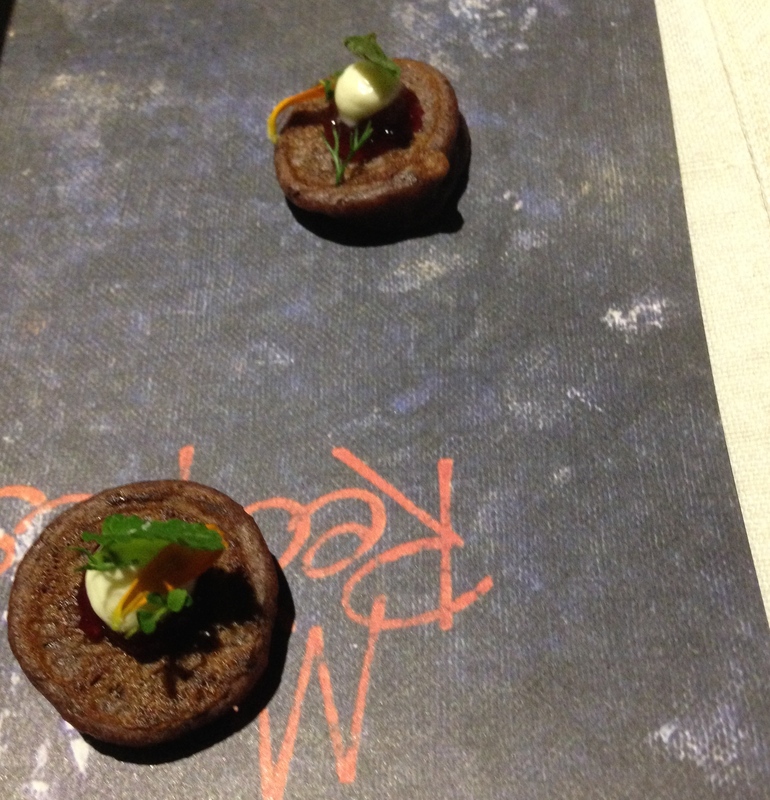 As it turns out, our first savoury course is one that you really do not want to miss. Cleverly the raw roo is hidden under a beautifully presented collage of thinly sliced red carrots. Not only does the carrot work for presentation, it adds texture to the dish. The roo is beautifully seasoned and it seems this is a terrific way to eat this meat, which is always a difficult one to cook. 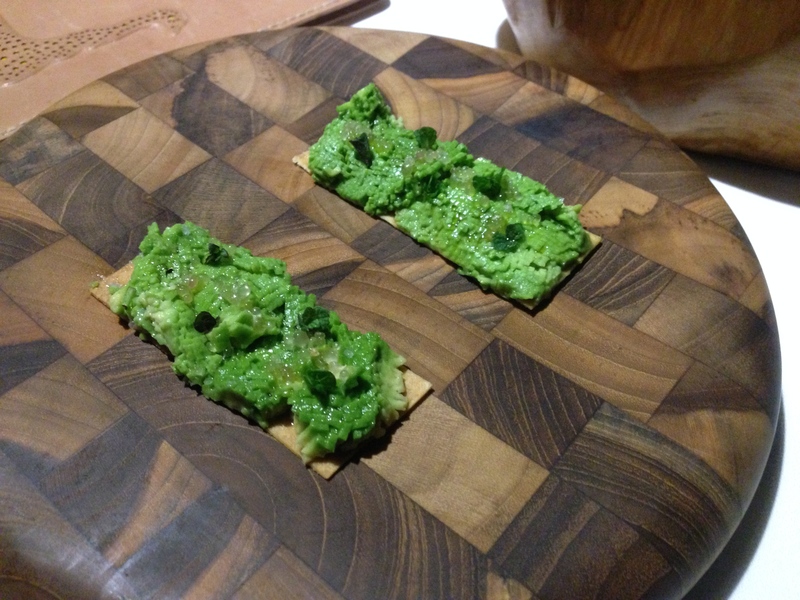 An ode to our breakfast culture comes in the form of “smashed avo on toast” with minced avocado, tiny mint, finger lime, and apple, on a crisp cracker. It evokes memories of the first time you tried this now staple café dish, and the intricacy pushes the boundaries of what is already a wonderful classic combination. Alongside the playful, and the intriguing, is the classical. 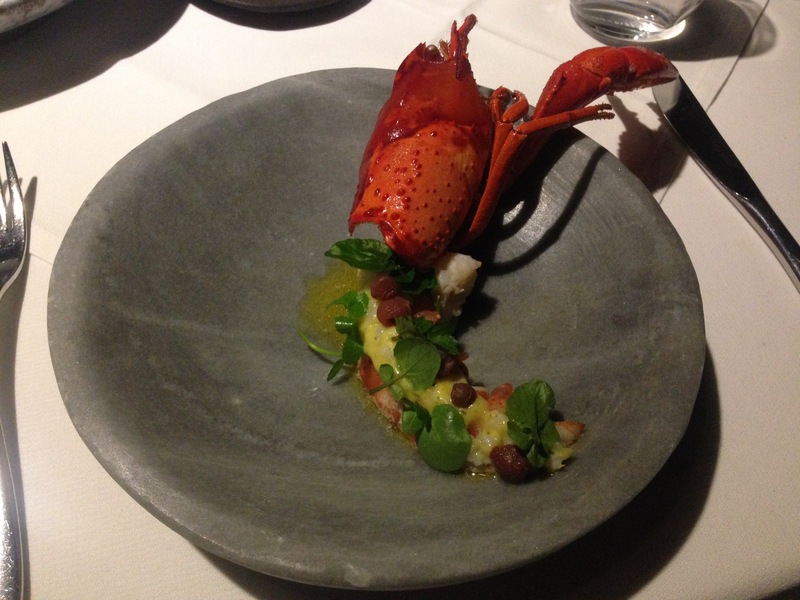 Glorious marron from my home state of Western Australia, is perfectly cooked, and comes with a lemon myrtle sauce, which is a feature ingredient of several dishes, including the equally sublime scallop snack. 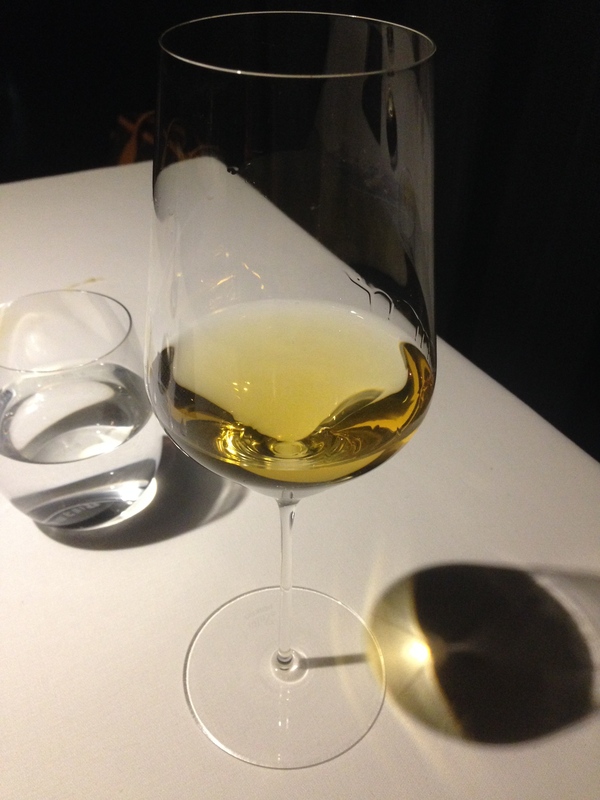 We were having wine by the glass off a reasonably priced and diverse list, and with this dish the elegant Domenica Roussanne Marsanne 2013 from Beechworth, worked beautifully. There were some other wine highlights, starting with the 2008 Lark Hill Sparkling from Canberra, which had the versatility you need with several courses of snacks. 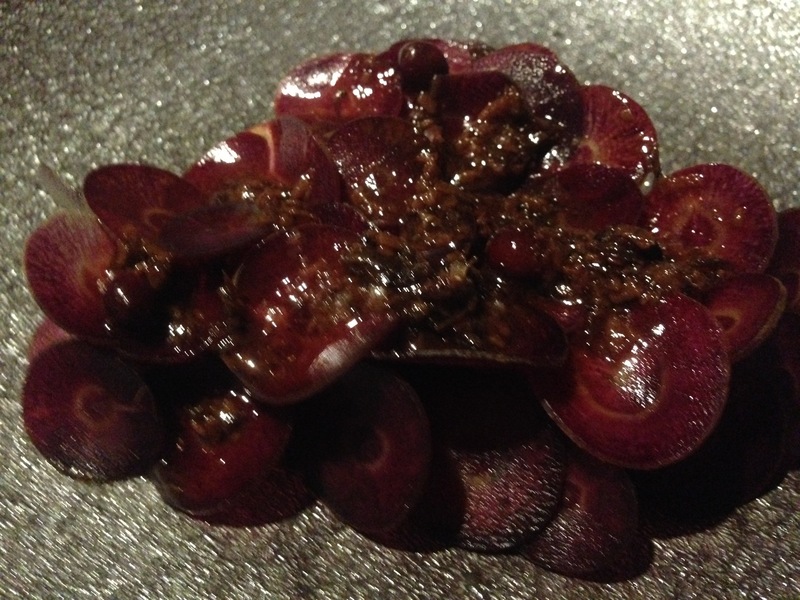 The Pinot Meunier Pinot Noir 2011 from Iron Bay Pot in Tasmania was also particularly good with the kangaroo tartare. 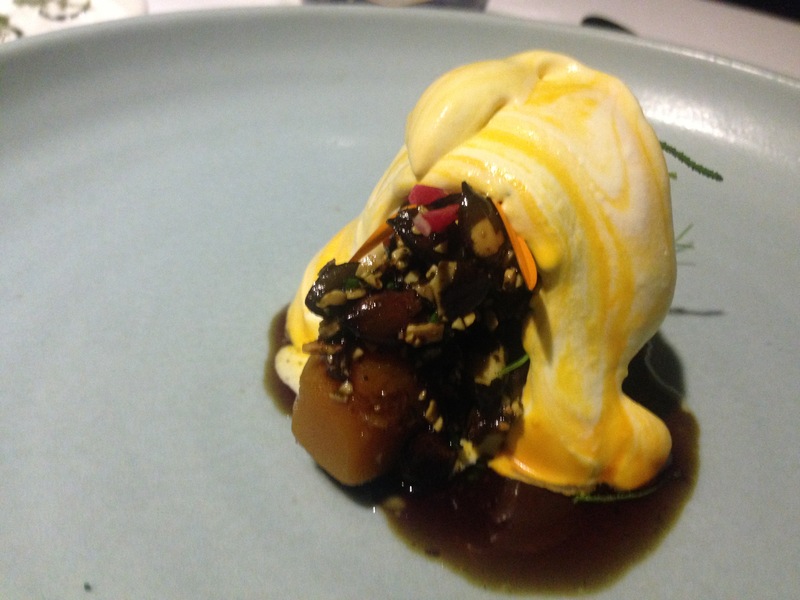 The famous potato cooked in its own soil has been replaced by an equally gorgeous “all parts of the pumpkin” dish that is a familiar concept having seen a similar focus at O.My recently. Texture from the seeds; richness from the flesh; and complexity from the sour beer cream infused with juice from the skin. It comes together in a dish that makes you feel like Shewry could turn his restaurant vegetarian tomorrow, and it would still be just as good. There is little theatrics, but a lot of novelty done in an intelligent way. 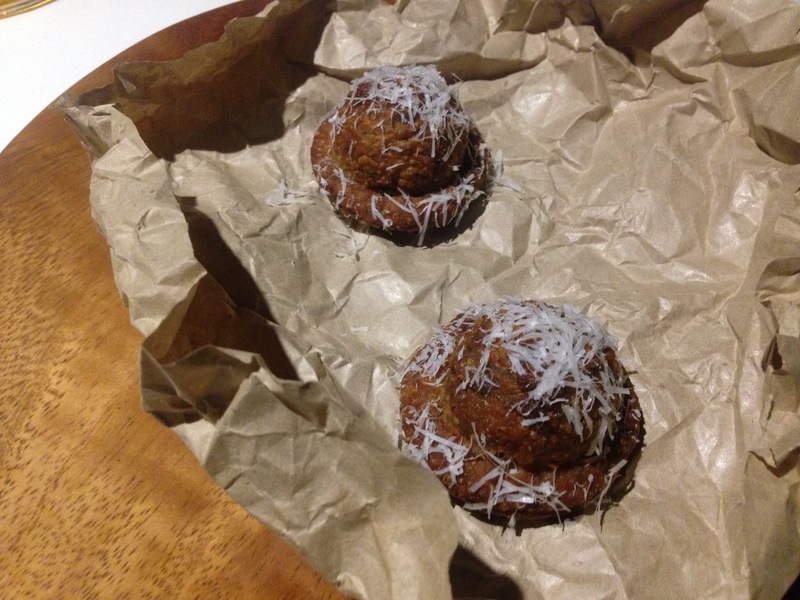 The wallaby blood pikelet sits atop a playful recipe that is not so much a recipe, but a larrikin’s tale. The crumbed mussels have some extra crunch from the pig face succulent topping, but are not as intriguing as the painted mussel shell. 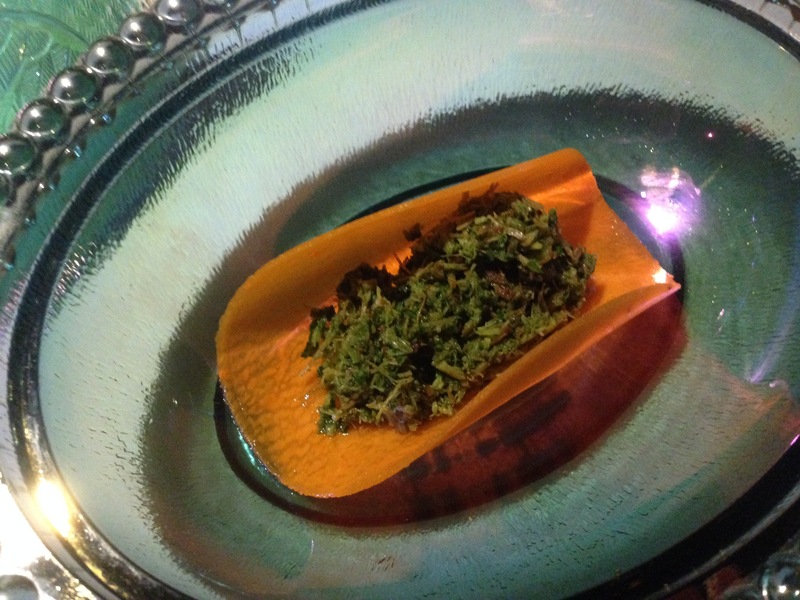 The carrot, which curls when put in freezing water, is presented in a hollow rooster dish, but the flavour of the chicken minced with sorrel, kale and tarragon, is impeccable, far outshadowing any of the fun presentation. 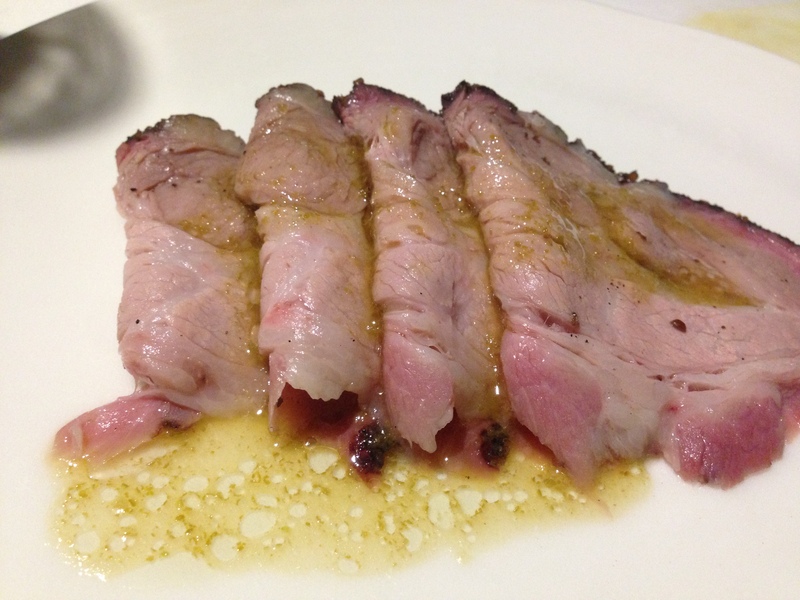 The other dish that stands out from earlier is the plainly presented pork neck. This is meat that sings. Astounded by the flavour I have to ask how it is done and learn that there is a combination of different cooking techniques over a 24 hour period, including smoking and grilling, to get to the depth of flavour that you only get a small but memorable taste of. 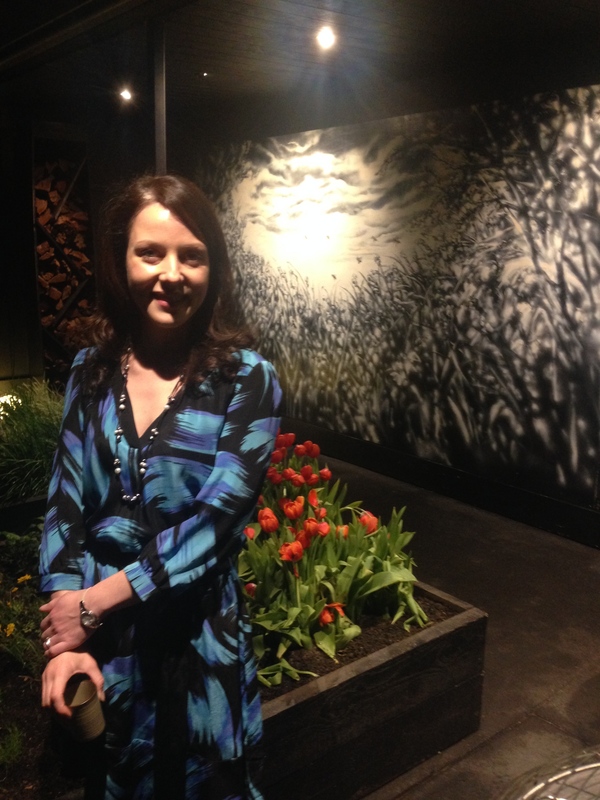 We finish our chat outside, cut a tulip for our first dessert course, hand it to the chef, and resume our seats. We are at the back of the restaurant in a smaller slightly separated room, laden with black curtains that do a good job to reduce noise levels. You feel a world away from Glen Eira Road outside, and it is a good looking restaurant, without that aspect being a particularly topical feature. It is more about minimising distraction from the food, and the good lighting is an example of the focus. 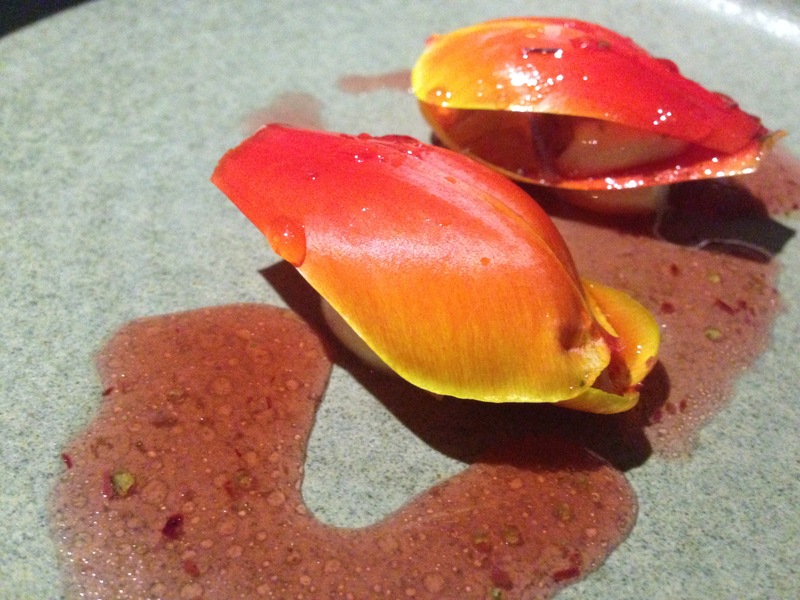 Our Tulips DIY comes out as our first dessert. We have just been told that there are only five edible tulip varieties in the world and the rest are very poisonous! Luckily these are edible and the fruit and cream cheese inside is delicious. If we thought that was a pretty dish, the next was almost as pretty, and definitely intricate. 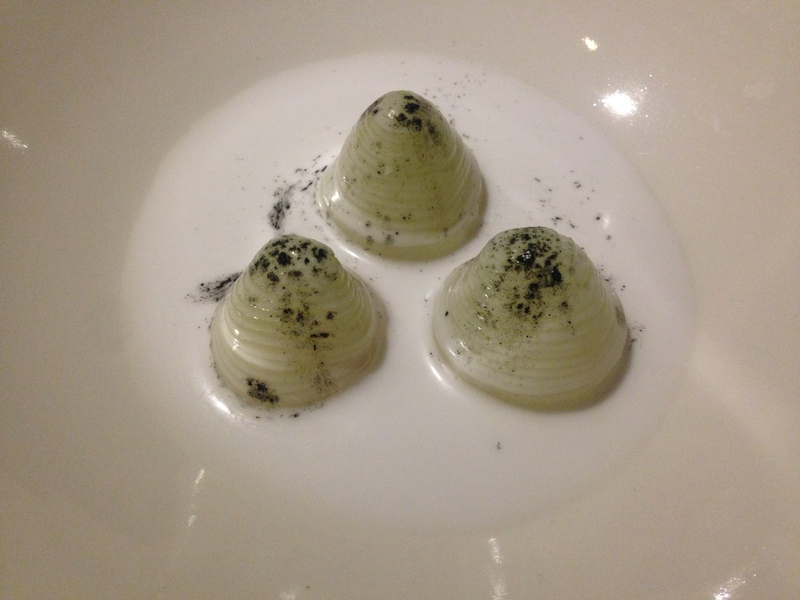 Three thimbles of apple, sitting in coconut cream, make for a more savoury dessert, but one that is still very nice. Crying out for something a bit sweeter, our prayers were answered with a decadent chocolate sponge, soaked in chocolate sauce with a yoghurt ice cream to soften the richness. 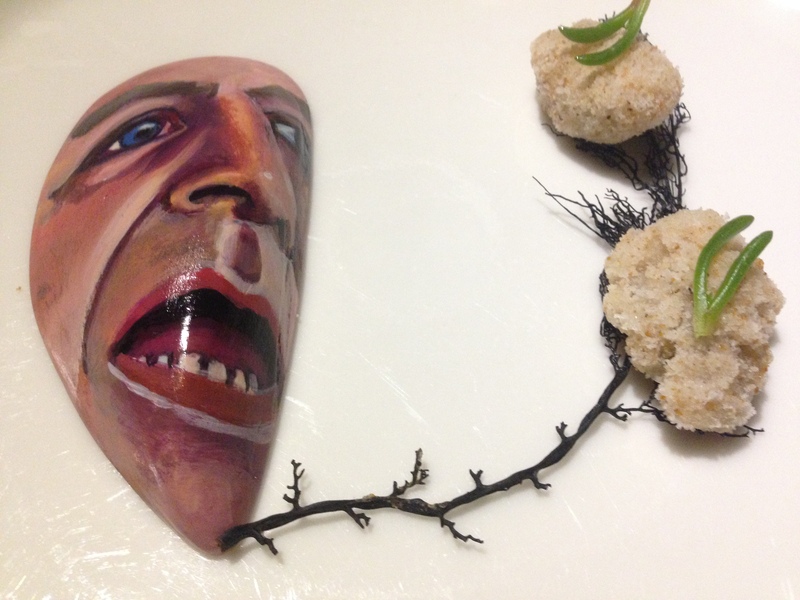 Finishing with another playful, and delicious taste, our “cheftales” are another ode to an Aussie classic, but again the take by Attica is better than the original, and comes with a “Who am I?” related to one of Australia’s numerous great chefs. There really has been absolutely nothing that didn’t work tonight. Quality through and through. 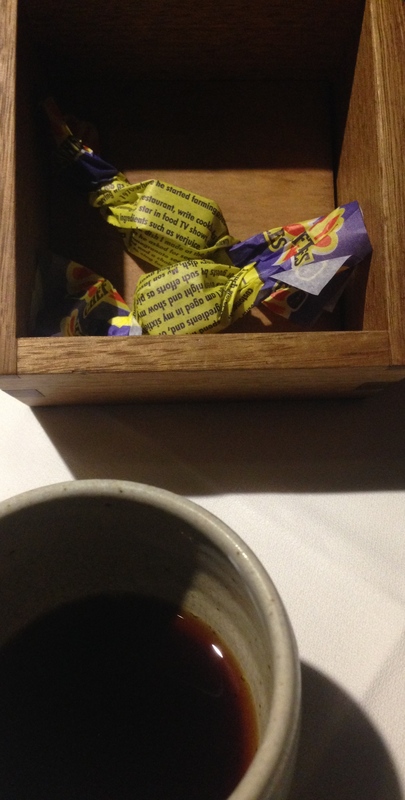 We go to restaurants for many reasons and we bring our expectations with us. All of my lofty expectations were realised, or even exceeded tonight, and that is no mean feat when you are off to one of the world’s great restaurants. With some good measuring sticks to compare some of the native Australian ingredients and their use (namely Orana and Igni) I can see the subtle reasons why Attica is rated at the top of the pile. 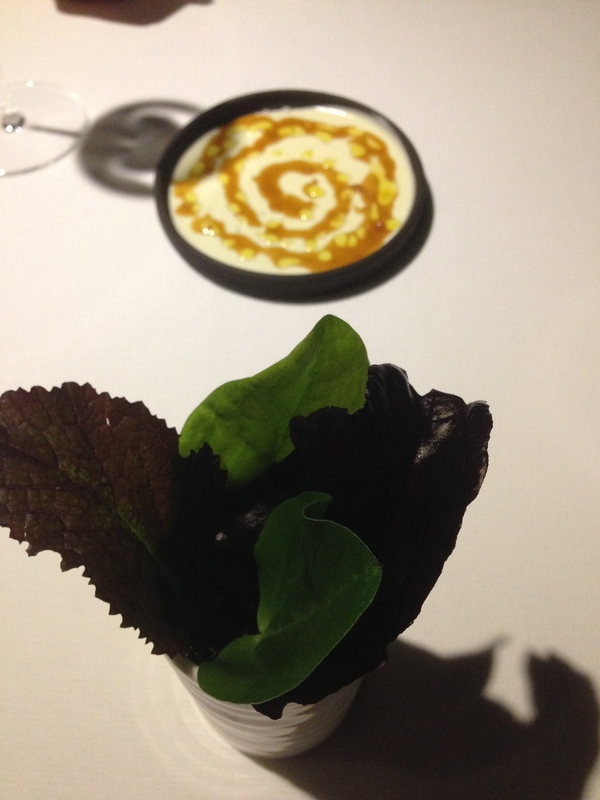 I wrote these thoughts before going to Attica but did not post them prior to dining (on purpose). I am off to Attica tonight and as you would expect I am excited. Like the label or not, we have a World’s Top 50 Restaurant in Melbourne, and that is something to be proud of. What do I expect from tonight? First, I have been to Attica just once, and it was five years ago. AGT tells me that naturally the restaurant has transformed completely (more than once most probably) and does not resemble my previous experience. So what I expect is all completely new dishes and a certain change in inspirations behind the dishes. After all, Ben Shewry was just becoming a “celebrity” at the time and has only broadened his perspectives since then with more travel, more acclaim, and more focus on his restaurant from a global audience. There have also been changes in the structure of ownership of the restaurant with Ben now the sole owner, and lately the experimental nights have been pulled, most likely to make sure every experience is consistently exceptional. I don’t read reviews in the lead up, or even try to have a look at the menu. I like the surprise and luckily, there is almost no ingredient I do not like (as long as it is eaten for pleasure, and not other purposes – in Bourdain’s words on food that does not taste good but is culturally important “to make you strong!”) I hope for a sweet dessert thrown in to the lately balanced (read savoury) theme at fine diners. I hope there is a protein I haven’t eaten often (or at all). I hope that his treatment of vegetable dishes elevates them in the way I know he can (with the now famous potato cooked in its own soil). I hope all of the snacks are sublime (yes, I use that word) and that they are all memorable. I hope service is perfect (not a completely unreasonable expectation in this type of establishment). I hope the coffee is okay. I’ve already decided I won’t get the matching wines. I like to have wines by the glass that are versatile and can match a couple of courses in a row. When I finish a glass I either know what I would like next having scanned the menu, or I simply go with exactly what the sommelier suggests. Normally the surprise of how much the glass costs on the bill at the end of the night is pleasant, but I try my best not to have a budget (even though I most certainly do). There is a gasp at looking at the per head cost of food here, but I justify it in several ways and put it in the background, essentially as part of the booking process. The other justification is it is not as much as the Fat Duck was (for friends – I didn’t go) and is not as much as most three michelin starred places in France, New York or London. Consistently exceptional food, perfect service, and versatile elegant wines. That is how I hope I can sum up tonight’s experience. Wish me luck!